Ever wonder what to do with your old ironing board? 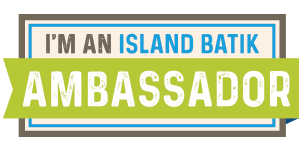 Check out this article in last month's Shoreline Journal. Let's face it: very few of us have the drawing abilities of Grandma Coco, who manages to turn everything she touches into a work of art. Most of us draw on other skills - not to mention what's at hand - to help our shapes look recognizable. Over the years I've built up a mental inventory of circular shapes of all sizes in our household. This large lid for a plastic container was not quite big enough for my purpose, so I bent the flexible ruler around it to add another 1/4" or so. Perfect. A Paderno pot lid defined the inner edges of my circle. Then it was down to this wide-mouth Corelle teacup to make scallops on the large circle. Note I have used masking tape on the cup to mark the placement on the line. To make my pattern symmetrical, I folded the tissue in half to mark the centre and darkened the lines on one half with a black Sharpie. I folded freezer paper in half and lined up the creases on the two papers. Then I traced the line. Folding my freezer paper in half, I cut along the black line, then folded it in quarters to trim my scallops to a uniform shape. I was left with this "tree" shaped background, upon which I will applique leaves and a trunk. The freezer paper will get ironed to the back side of the fabric and cut with an added seam allowance for turned-edge applique. We have another great "sew and tell" from the Maple Leaf Quilters. 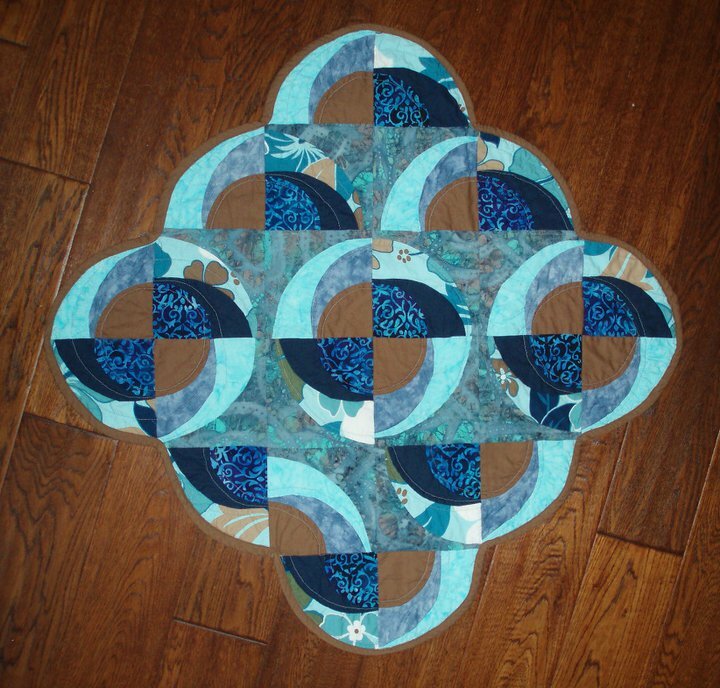 Instructor Val did a class on Maritime Beauty, and writes this: "...it seems people are a little intimidated with binding these curved edge quilts. 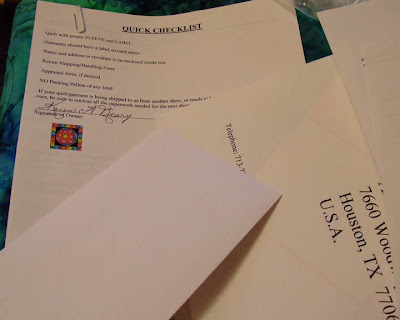 You have great instructions and I walk them through the process but they are still leery." She's right; it takes a lot of encouragement sometimes to convince folks it isn't difficult. Once you try it, you wonder why you didn't do it sooner! 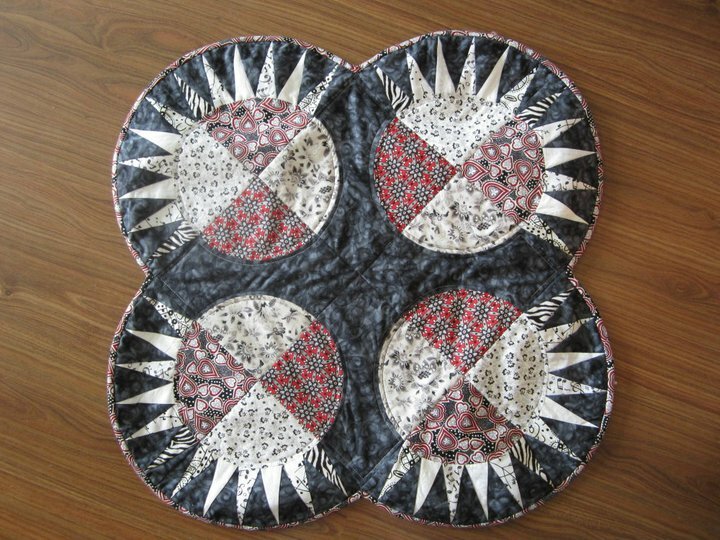 Here's Val's version: Val also made the matching placemat which is included with the pattern. I love the colours she has chosen - my favourite palette. Melinda used a variety of maple leaf prints in her gorgeous "four seasons" version. Love it!! Here is Jody's cheery, colourful piece. This looks like spring. The dark background used by Doris B clearly defines each spiked section. It's so interesting to see how our eyes are led to see certain things based just on colour. 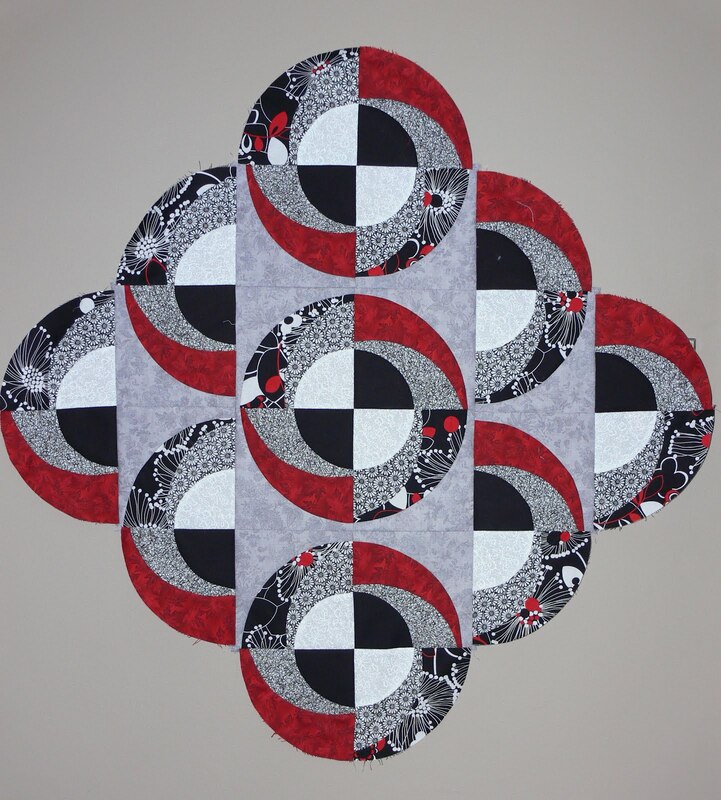 You can enjoy more pictures from The Maple Leaf Quilters on previous a post here. If you'd like to make your own Maritime Beauty, pattern # 108 is available from my website. Thank you Val, Melinda, Jody and Doris for sharing your beautiful work. The Pentecost Antependium got off to a rocky start. My original plan for using shot silk for the flames did not work out. After I had them - as well as the dove - all stitched in place, I simply did not like how they looked. The whole thing got ditched and I started over from scratch. I cut flames from several shades of orange...and red...and yellow, and multi-coloured prints before I finally found the look that suited me. While I wrestled with the flames, Polly wrestled with the scraps. What a team! On another shopping expedition earlier today, I found the perfect beaded tassel to hang from the point. We are almost finished. This beautiful green dupioni silk also found itself in my cart, so the antependium for "Ordinary Time" will be next. A big thank you to my clever and learned friend Jennifer (aka The Bronze Wombat) who came to my aid with the proper term for this iridescent silk. I termed it "duplicitous" but the correct word of course is "shot". You can read a little more about the process on Wikipedia. 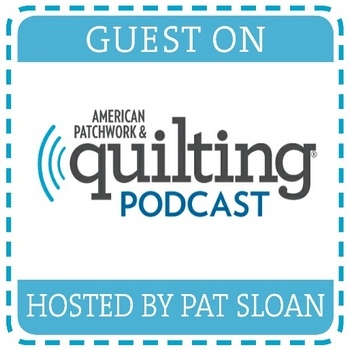 Last week, fellow quilter Lesley invited me to meet a couple of her visiting quilting friends. Over tea at Bella's with Jane and Berni, I discovered I had met 2/3 of the Sheltered Cove Maritime Quilt Co.! (as well as another Mayflower). They are a young company, dedicated to making and selling quilts produced here in the Maritimes. 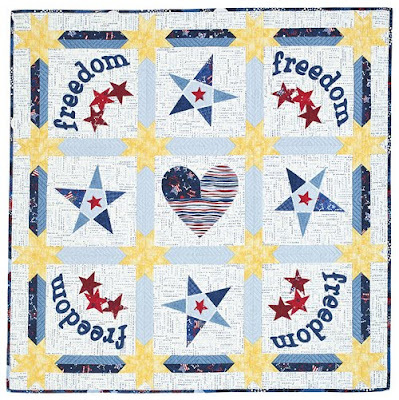 Click on their Gallery page to enjoy a virtual quilt show. With the Easter antependium completed, it's time to start another. Logically, it would be green for Ordinary Time next but I am still working on that one in my head. 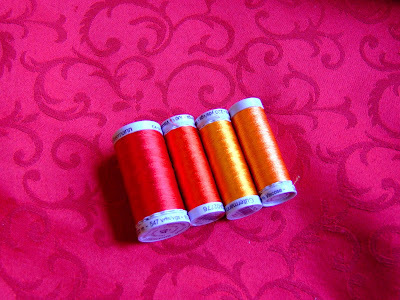 I suspect my subconscious is in control, as I couldn't stop thinking about the gorgeous fabrics for Pentecost. I allowed myself to skip ahead. For the flames, I am using this exquisite, duplicitous dupioni silk. It is orange in one light and red in another - see the difference when I tip up the edge to catch the light? No other fabric reacts to light like silk, and it's perfect to use for the flames. Admittedly, there isn't much new to be done with the theme: a dove dive-bombing into tongues of flame is pretty standard. I've drawn out my dove so she is gently descending tail first, with wings spread wide. The flame shape has been enlarged to become the dove's wings. Under the flames will be a line of gold, either stitched in metallic thread or formed by couching a thick thread or trim. I have some of each to experiment with. No doubt there are wonderful tools on the market to make this task easier, but I'm big on using what's at hand. The purple cover of my spray starch measured 3", so placing it half-way on my 60 degree line made perfect 1-1/2" scallops. I cut them from freezer paper first, then ironed the paper pattern to my fabric. I traced the scallops with a disappearing marker and then basted along the line with gold metallic thread. Even though it would have shown up better in white thread, I have learned the hard way it is easier to have the basting stitches match the colour of the finished line. This way if there is an errant thread which pops out in the final stitching, it blends in instead of driving you nuts trying to get it out of there. I've had this roll of Clover fusible gold bias binding for many years. Was this the perfect project it's been waiting for? I think so! It went on amazingly easily, following the line of stitching with just a little prodding from a large pearl pin. Because it is polyester, I was careful to use a press cloth. I edge-stitched with gold metallic thread (YLI) and am ready now to start on the flames. 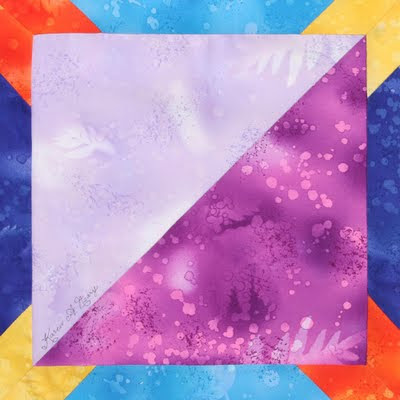 Awhile back The Maple Leaf Quilters in British Columbia hosted a workshop on my Fruit Smoothie pattern. The Maple Leaf Quilters are a team of sisters - Joan and Valerie - who share their expertise and love of quilting in workshops and retreats. You can check out their blog to see what they've been up to. Here are some pictures of the quilts from their class. This colourful one was made by Valerie. This one is by Joan. Isn't it striking in red, black and white? Lorraine used the same combination for hers. The 3-D effect in Ruth 's is pretty amazing. It's really spinning. Great colour choices, Ruth! Tropical colours jazz up Liz's version. Doris chose soft flowery prints. Thanks to all for sharing the pictures. If you'd like to try your hand at a Fruit Smoothie, the pattern may be purchased on my website (#410). I ordered a carton of my favourite wool quilt batting. It just happens to be Polly's favourite too. Even through the plastic wrapping, that wool beckons with the promise of warmth and softness. Polly wasted no time establishing her claim. It's like curling up with Mama cat. With all the upcoming projects, fabric buying has been a necessity. I was able to take advantage of Spring Break trips to Moncton and Halifax and pop into a couple of stores. These fabrics will go into the liturgical antependiums I am stitching. Even though the colour is a bit off in the photo, this brilliant red will be stitched with flames for Pentecost. I expect there to be a bit of gold in there as well, but I haven't located anything suitable as yet. Light and dark purple dupioni silk is perfect for Lent; those 30 silver coins appear to be embossed with the head of a Roman emperor. What a find! This week in Halifax, fabrics from Timeless Treasures jumped into my arms as I entered the store; it was like they knew me. (Come to Mama!) They are from the "Plume" collection and the blue-greens and gold are so appealing. Not sure as yet what I will make from these, but I know I will enjoy working with this fabric. It's gorgeous! Hmmm...and now that I see them on the screen, that gold looks as though it would work in the Pentecost antependium. Why didn't I buy more of that one? Before I can start on sewing any of these fabrics though, the binding for the Trend Tex Challenge quilt needs to get stitched down and the final embellishments added. It's almost there. "...what to leave in, what to leave out..." (Bob Seeger, Against The Wind). The past few weeks have certainly felt like running against the wind...or the clock. Work on the antependiums progresses - the first was delivered this week actually (more on that later)- and now the deadline for mailing the Farrago quilt to the O Canada exhibit in Houston is here. I went over and over and over the checklist many times to make certain everything is there, and then sent it on its way. It needs to arrive in Houston by next Friday and even though it went 3 day delivery, my confidence was shaken last week by another parcel that went the same way...and took 5 days. Like raising kids, you send them on their way and hope for the best. With Farrago out the door, next up is the Trend Tex Challenge. This annual fundraiser for the Canadian Quilter's Association is one I have been doing for many years. It's fun to do (when there's time). This year's fabrics present a real challenge in that they are watery, pale pastels...so not me. The theme is, At Home In My Garden By The Sea. I won't show the whole quilt until the deadline passes but here's a sneak peak for Mary who is working on the same challenge with similar enthusiasm for the fabrics. Where's the bright red or green when you need it? My sea garden needs lobsters...! I'm still blown away by the sheer number and variety in colour of neckties from this collection. Talk about a well-dressed man! 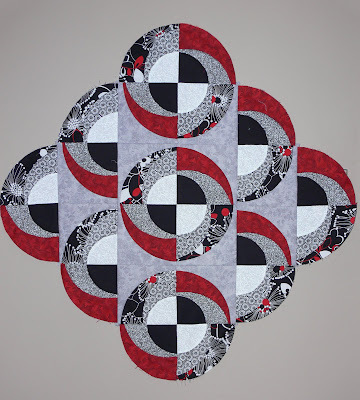 Last May, I had a block published in Quiltmaker's 100 Blocks From Today's Top Designers, Vol 3. In the magazine, you are presented with 100 original blocks and instructions for making them but no quilt patterns. The good folks at Quiltmaker have put together a magazine of quilts made from these original blocks. My block was named Hidden Star. On a blogspot from last May, I gave several layout suggestions for use in a quilt, such as the one shown below. 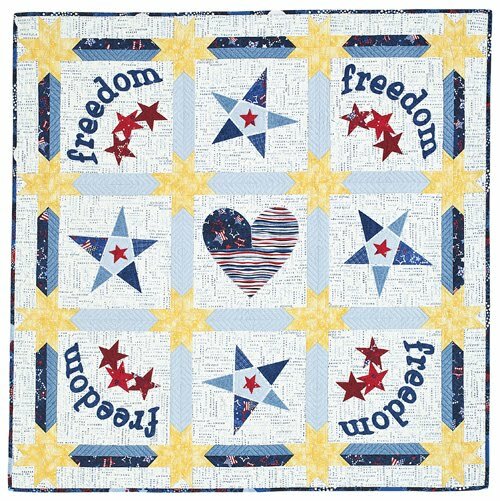 Peg Spradlin has cleverly varied my block and combined it with 3 others from that same issue in this very patriotic quilt entitled "Let Freedom Ring." Another of Peg's quilts appears on the cover, "Irish Spring Surprise" shown below on the left. It's beautifully quilted with bee motifs among the flowers . If you've been looking for ideas on how to use the blocks from the magazine in a quilt, this issue is on newstands now. Visit the Quiltmaker site and click on the magazine image to see more quilts from the issue. 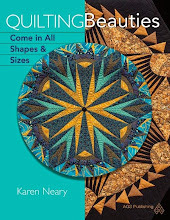 On the Quiltmaker blog, you can enter to win a free copy.